Awning maintenance is an important aspect to consider. 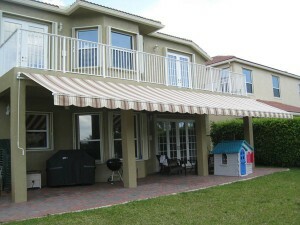 Awnings are an important investment in your home. In order to protect the investment that you made, you will need to perform regular maintenance. Depending on the type of awning that you have, retractable or stationary, and the material it is made from, you might need to spend some time once a season or once a year. Here is our best advice for properly maintaining your awning. Move plants, vines, and hanging flower baskets away from the cloth of your awning. Their contact with the surface of the cloth can damage and stain the fabric. Regularly check for rust or tears in your awning and correct them as quickly as possible. These are relatively minor problems that can turn into big headaches down the road. Retractable awnings need less maintenance, because they are not constantly exposed to the elements. Never allow heavy objects to rest on top of the awning. Puddles or water or pieces of debris from a storm can stretch out the material over time. Put down your retractable awning whenever there is going to be a storm, as high winds and large amounts of precipitation can damage the structure itself. Always oil your hinges on your retractable awning so that it is easy to open and close.